of Our Voice, at Edmonton, Canada. A young Edmontonian, Kerri Charest, saw my documentary "Cachilo, the poet of the walls" in the Global Visions Festival, searched in the internet, found Cachilo 's website, and contacted me by email. She also sent me the October issue of Our Voice, in which a commentary on my film had been published. It has been a joy to me to learn about these responses to "Cachilo,.." in Canada. The commentary, written by Natasha Laurence, is focused on the subject rather than on the form or style of the film itself . The task of the reviewer supposed in advance both the advantage of a distant vision and the disadvantage of a possible lack of knowledge about the context of the subject. Natasha says that Cachilo , although being a marginalized homeless man , received a special attention of people because his voice was raised at a time when other voices were silenced. Natasha's commentary made us clearer a truth we already knew. 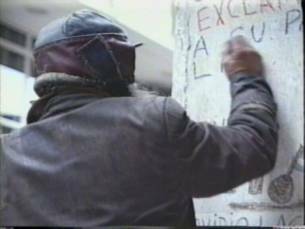 Certainly, the first mural writings of Cachilo date from 1980 and the military dictatorship lasted between 1976 and 1983. This commentary of Natasha has mobilized my mind and provoked to me more than a reflection. Seventeen years Have passed since the recovery of democracy, and many things have not changed too much. It is as if the military dictatorship in the political power has given its place to the dictatorship of economic power, and the state of terror under the military, with its perverse policy of the disappeared had been replaced by the terror of the economy over all things, with its policy of adjustment that generates great numbers of the social excluded, the "disappeared" of democracy. At the same time, it is not difficult to detect signs of authoritarianism in any civil employee who has some power in the ruling democracy. On the other hand, it seems to me that in the current conditions of world globalization the combination of the absolute power of the economy with the authoritarianism of civil employees is not confined to Argentina. Finally I return to rescue the voice of Cachilo over the circumstances surrounding him, because his unique poetry continues to astonish today's people, although the predominating nihilism and the considerable inclination to a model of success tied to economics continue to confine Cachilo to the margins where he has always been.